But they would risk losing white Republicans. Sen. Ted Cruz, left, and Sen. Marco Rubio talk after a Republican presidential primary debate on Jan. 28 in Des Moines, Iowa. Even after Marco Rubio’s and Ted Cruz’s respective fifth-place and third-place finishes in New Hampshire, the GOP is closer to nominating a Latino candidate for president than either major party has ever been. As of this writing, betting markets give Rubio and Cruz a combined 39 percent chance to be the GOP nominee, and if anything, the markets might understate Cruz’s chances. That prospect is likely to brighten Republicans’ hopes. After the 2012 election, the Republican National Committee’s post-mortem called for the party to broaden its appeal to growing, Democratic-leaning constituencies, with Latinos chief among them. Cruz himself said in 2012: “If Republicans do not do better in the Hispanic community, in a few short years Republicans will no longer be the majority party” in Texas. But just how much would nominating Cruz or Rubio help the Republicans with Latinos? On the surface, the two candidates have similarities aplenty. Both are in their mid-40s and among the most conservative sitting senators. Both are of Cuban descent. But they differ in how they approach their ethnic background: While Rubio speaks fluent Spanish, Cruz has called his Spanish “lousy,” a fact which Rubio mocked in Saturday night’s debate. They also famously differed in their roles in the failed push for immigration reform in 2013: Rubio worked with Democrats to draft comprehensive immigration reform while Cruz opposed the measure. Assessing the likely appeal of Cruz or Rubio among Latinos is not straightforward. Latinos are diverse, with many strongly attached to individual national origin groups as well as the pan-ethnic labels “Latino” or “Hispanic.” In the 2010 census, 44 percent of people who identified as Hispanic wrote in “Mexican” on a question about racial background. And it’s not clear whether candidates of Cuban descent have much appeal among Mexican-descended voters, especially in swing states like Nevada and Colorado. On the one hand, the weakness of Mitt Romney’s 2012 performance with Latinos — he won just 27 percent of their votes, down from around 40 percent back in 2004 for George W. Bush — means that there is plenty of room for growth. And prior research shows that in mayoral elections, Latino candidates do win over Latino voters at higher rates than other candidates. As we’ll see, Cruz and Rubio have earned votes from Latinos who didn’t back the last two GOP standard-bearers. But in an appeal to Latino voters, there is peril as well as promise. Overtures to Latino voters have the potential to alienate another key GOP demographic: anti-immigration whites. So the GOP’s hope to win votes from Latinos faces two roadblocks. One stems from the diversity of the Latino population, the other from diversity within the Republican Party. One way to know whether Rubio is right is to look at how he and Cruz have done with Latinos in Novembers past. Rubio was elected to the U.S. Senate in the 2010 Republican wave, and impressively, he picked off not only the Democratic nominee but also the sitting governor of Florida, Charlie Crist, who was running as an independent. Exit polls initially indicated that Rubio picked up 55 percent of the Latinos interviewed, a substantial improvement from the 42 percent of Latinos who backed John McCain for president in Florida in 2008. But the 2010 Florida exit poll had all of 73 Hispanic voters. And even if the sample were larger, exit polls can be unreliable when estimating the leanings of groups who live disproportionately in certain places. We don’t know if the precincts selected for the poll that year happened to be in heavily Cuban areas near Miami, in Puerto Rican enclaves in the central part of the state, or elsewhere. To get around those limits, I looked at precinct-level returns from that race. They yield a striking pattern. As the share of Latinos of Cuban descent grew within a precinct, so did the amount by which Rubio’s 2010 bid outpaced McCain’s in 2008. The relationship was even stronger in precincts that were heavily Puerto Rican. However, in more heavily Mexican precincts, there was essentially no relationship — people of Mexican descent are the largest Latino group in some parts of Florida. Best we can tell, Rubio got more of a boost among Latinos of Cuban or Puerto Rican descent. These differences speak to the diversity of the Latino population. They also might reflect the effects of immigration policy. Keep in mind that Puerto Ricans are U.S. citizens by birth and that Cuban immigrants who reach U.S. soil can apply for residency one year later. The immigration debate and the appeal of candidates like Rubio might resonate quite differently among Latinos connected to different places of origin. Of course, Latinos are by no means one-issue voters, as Matt Barreto and Gary Segura’s new book details. But judging by the jump in President Obama’s approval ratings among Hispanics after his November 2014 executive actions on immigration, the issue does loom large for many. We saw earlier evidence of this in the 2012 election, when Mitt Romney advocated “self deportation” and Latinos saw among the largest pro-Democratic shifts in voting of any group. Rubio himself has tacked away from comprehensive immigration reform and his latitude to embrace it again is limited. So Rubio does seem to have won Latino votes in Florida that McCain did not, but those votes likely came from Latinos from specific national-origin groups. What about Cruz? When Cruz ran for a U.S. Senate seat in Texas in 2012, there was no exit poll at all. But there, too, we can approximate the boost Cruz earned in Hispanic communities using election returns. This analysis is particularly important for 2016, since Texas is home to approximately 8 million Latinos of Mexican descent, and since Mexicans are by far the largest Latino group nationally, at 64 percent. 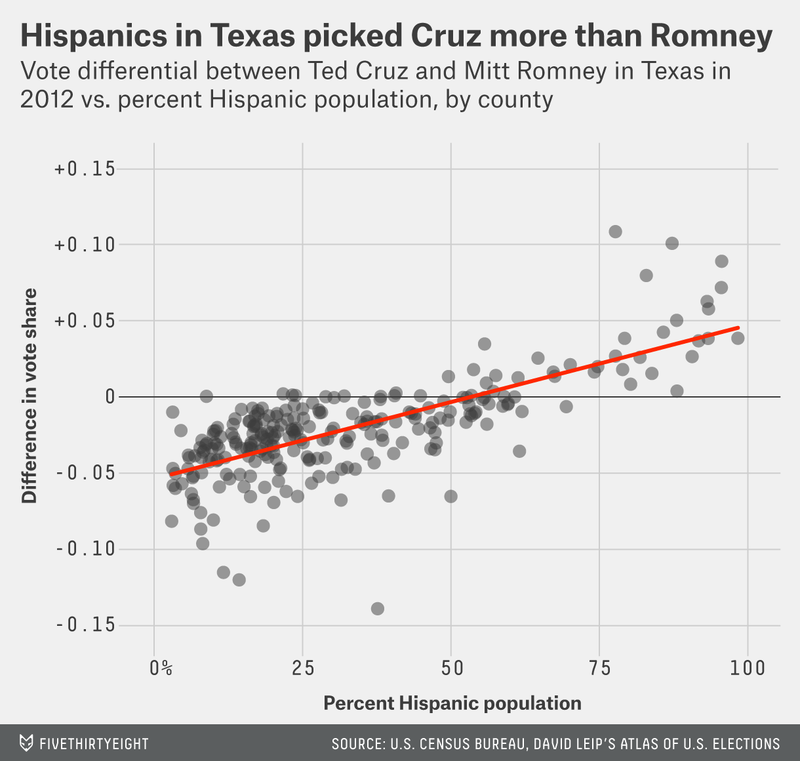 The chart below plots the Hispanic population of Texas’s 254 counties on the x-axis and the difference in support won by Cruz and by Romney, who appeared on the same ballot in 2012, on the y-axis. There are limits to what we can learn from exit polls or from aggregate election returns, especially in races that have three well-known candidates (like Rubio’s) or races that are uncompetitive (like Cruz’s). Presidential elections are a different beast. Each senator’s public profile has undeniably grown since he was elected to the Senate, too. Accordingly, we might consider a third approach to estimating the pro-GOP boost that Cruz or Rubio might bring as the party’s nominee for president: looking at contemporary survey data. Most surveys don’t break out their results for Latinos, and many don’t interview in Spanish. But a 2014 survey by Latino Decisions found Rubio’s detractors to outnumber his admirers. He was viewed favorably by 31 percent of the Latinos interviewed and unfavorably by 36 percent, numbers that match what the Public Religion Research Institute found in November 2015. Gallup surveys in the summer of 2015 found Rubio polling notably better among Hispanics, with those viewing him favorably outnumbering those viewing him unfavorably by 5 percentage points. Yet the same polls found Cruz underwater by 7 percentage points, reinforcing the idea that Latinos judge Cruz and Rubio not just on ethnicity but also on their positions and profile. One Texas media consultant said he’s “not sure that Hispanic Republicans really believe that Ted Cruz represents them and their values and their issues.” There are similar questions about Rubio’s connection to Latinos. Can the candidates sell themselves to Latinos come November? Both have certainly tried in the past, in part through Spanish-language advertising. Take this ad from Rubio’s 2010 Senate bid, in which a grateful Rubio acknowledges the support he’s received from Latinos and promises, “We will honor the sacrifices of previous generations.” Or this ad from Cruz’s presidential bid, which touts his family’s immigrant background and his role as the first Hispanic clerk to the chief justice of the Supreme Court. You’ll notice that those ads play up the candidates’ experiences in immigrant families. But they are heavy on personal appeals and light on policy. And even appeals like those could get the candidates in trouble if they aren’t carefully targeted. While Latinos’ views of Cruz and Rubio are mixed, views of the GOP front-runner, Donald Trump, are highly negative. In his June 2015 speech announcing his candidacy, Trump called Mexican immigrants “rapists” and said that Mexico was “not sending their best.” Come the fall, Cruz or Rubio would need the backing of many of Trump’s supporters and of other non-Hispanic white voters who see immigration as a major threat. That may limit either candidate’s ability to appeal explicitly to Latinos. The odd exchange between Cruz and Rubio makes plain the conflicting incentives they face. In a series of survey experiments, political scientists Eitan Hersh and Brian Schaffner considered what happens when group-specific campaign appeals are poorly targeted, for example when white voters hear Latino-specific messages. The result is a backlash against the sponsoring candidate. That meshes with findings from my own research. A sizable part of the GOP electorate sees Spanish as a potent symbol of a changing America. In one study I conducted, Republican respondents adopted views that were more strongly anti-immigration after hearing a few lines of Spanish in a newscast. What’s more, Republicans voting in precincts that used Spanish-language ballots became more opposed to bilingual education. So the possibility of a backlash against Cruz or Rubio for using Spanish — or perhaps for emphasizing their ethnicity — is real. Come November, if either Cruz or Rubio is on the GOP ticket, he will want to win Latino votes. But he’ll want to do so while still turning out Trump backers and others worried about immigration and Spanish. Analyses of their Senate elections suggest that both candidates have the potential to improve upon the GOP’s performance with Latinos nationally, especially with certain national-origin groups. Given where Latinos from different countries tend to settle, those improvements are likely to be larger in Florida than in Colorado or Nevada. But whether the candidates can capitalize on that potential without losing other voters remains to be seen. Thanks to FiveThirtyEight’s handy calculator, you can see for yourself what an 8-percentage-point shift in Latino voting would do to balance the electoral college.